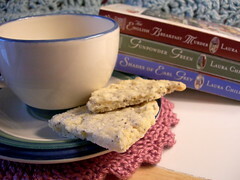 For the last entry during Foodie Lit Madness, I have chosen a recipe from one of the Tea Shop Mysteries by Laura Child. I first picked these up because I was trying to read as many books set in South Carolina as possible, but when she added in themes of a tea shop and recipes (one character is more of a baker/caterer, who works in the tea shop), I was hooked! The main character (and amateur sleuth) is Theodosia Browning, owner of the Indigo Teahouse in Charleston, South Carolina. This recipe is from a book I don't have yet, but can be found on Laura Childs' site. I am reprinting it here because she specifically gave me permission (thanks!). Cream butter and powdered sugar, stir in poppy seeds and lemon juice. Gradually add flour, mixing well. Divide dough into four portions and roll our each portion into a 4˝ circle on a lightly floured surface. Cut each circle into six wedges. Prick dough with fork and sprinkle with sugar. Bake at 325 degrees for 20-25 minutes. Cool, then break into wedges. Jenny's notes: I was impatient and didn't wait for the butter to get soft enough, and as a result had to add quite a bit of cream to get all the flour to absorb into the dough. I added a little extra lemon juice too. The flavor is good, and baking the rounds on parchment paper helped them not to brown too much on the bottoms and the edges. March is Foodie Lit Madness! This week's featured author is Joanne Fluke, who writes the Hannah Swensen Mysteries. 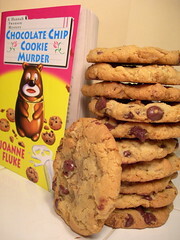 Chocolate Chip Cookie Murder is the first of the series, and features Hannah Swensen, baker and amateur detective, who tries to figure out who killed her milk delivery man. This book is the first of nine (so far) and each features a different type of baked good! There are seven cookie recipes in this one, sprinkled throughout the book as the recipes are mentioned. It took a long time to decide on one, but ultimately I picked this recipe because it went with the book title (but I reserve the right to make the chocolate covered cherry cookies that sound SOOOO good)!! I love how the recipes interact with the story. It made me feel like I was participating too! I contacted the author, who graciously gave her permission to post a recipe in this blog. Thanks, Ms. Fluke! Melt the butter, add the sugars and stir. Add soda, salt, vanilla, and beaten eggs. Mix well. Then add flour and stir it in. Add crushed corn flakes and chocolate chips and mix it all in thoroughly. Form dough into walnut-sized balls with your fingers, and place on a greased cookie sheet, 12 to a standard sheet. Press them down with a floured fork in a crisscross pattern. Bake at 375 degrees for 10 minutes. Cool on the cookie sheet for 2 minutes, then move to a wire rack until they are completely cool. (The rack is important - it makes them crisp). According to the story, these cookies are a favorite of Andrea's, Hannah's sister. I was giggling as I typed up this recipe, because I completely skipped flattening out the dough before baking, which explains why I had to bake mine 2-3 extra minutes. I also didn't have cornflakes on hand, so I used Post Great Grains cereal. Probably any crunchy cereal will do, but I actually liked using this one - it had flakes, granola, and pecans in it. I ended up giving up and mixing in the cereal and chocolate chips with my hands. I love the taste and texture of these cookies. I have a tried and true chocolate chip cookie recipe, but this was a nice change with the crunchy elements and sweeter taste. I wasn't sure if the recipes would actually be any good, since this isn't really a cookbook - I was perfectly prepared for them to be sheer novelty but not quality, but I was happily mistaken! Now I'm excited to buy the rest of the series (I only have Strawberry Shortcake Murder) and try more of the recipes! I always try to visit a bakery when I go to a new town. While in Pittsburgh at the end of February, I had planned to visit the Jenny Lee Bakery (just liked the name). I found it but it was under renovation and closed until April. I looked up "Pittsburgh and bakery" in Google, and came up with Enrico Biscotti. I remembered seeing them on the Food Network, and was ecstatic to go there! One afternoon I had a few hours free, so I ventured out with Terry from the last university I worked at. We took a cab there, and it was located in a section of town with a lot of Italian shops and an open-air market feel (despite the snowy weather). The people working there (might be the owners) were incredibly friendly, wanted to know how we found out about them, where we were from, why we were there, etc. They even took the time to take our picture (if you click on the picture above, you can see others from my trip). What was the most amazing was the smell. Imagine the smell of one biscotti, and multiply it by 1,000! They must have had at least twenty different kinds. I bought bags of apricot hazelnut and chocolate vanilla swirl to share with co-workers, and bought a half dozen for my husband and I - chocolate chip, peanut butter chocolate chip, pumpkin, cranberry, chocolate covered almond, and double chocolate. 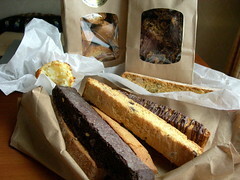 All biscotti are crunchy, but many are stale tasting and hard. These were perfect, and had so much flavor - I wish I had purchased much more. Lucky for me, I can buy some more online. I also bought one macaroon that was the most buttery and tender macaroon I have ever had. (You might notice in the picture that the macaroon is barely pictured as I took a bite before taking a photo!). If you are in Pittsburgh, do not skip a trip to Enrico Biscotti! 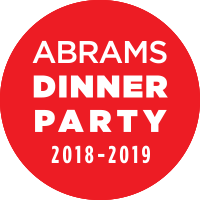 This month I am going to focus on recipes from what I call "foodie lit" - books that are not cookbooks, but contain recipes. Usually they go along with the story, and often the main character is involved in food preparation in some way. There are several mystery authors out there that write food-themed series. Goldy Bear is a caterer and single Mom featured in Diane Mott Davidson's books, who lives in Colorado but seems to work as an amateur detective almost more than she works as a caterer! In Double Shot, Goldy finds out her ex-husband has been released from prison, but is he responsible for everything happening to sabotage her business? I actually haven't read this book. I started back at the beginning of the series, but this recipe was one of the ones actually available on her site. You can get to it here, although you might have to log in. At Furman, we sometimes have a booktalk during our library faculty/staff meetings called "The Book Stops Here." 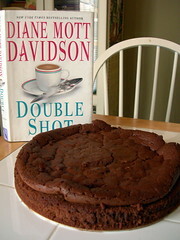 In February my co-worker and I did a shared booktalk on foodie lit, and I made and brought this cake. It was very rich and the recommended whipped cream is almost a requirement because of its density and darkness. I used Nestle Chocolatier bittersweet baking chocolate, and have been pleased with its consistency and quality.